Circa 1970 photograph that illustrates the humble start of the Mill Avenue Art Festival. The Andre Building, home to Rula Bula is at left. Today Restaurant Mexico occupies the Chipman-Peterson Building at right. 1968. It was the year of the first Mill Avenue… Well, we’ll get to that in a bit. 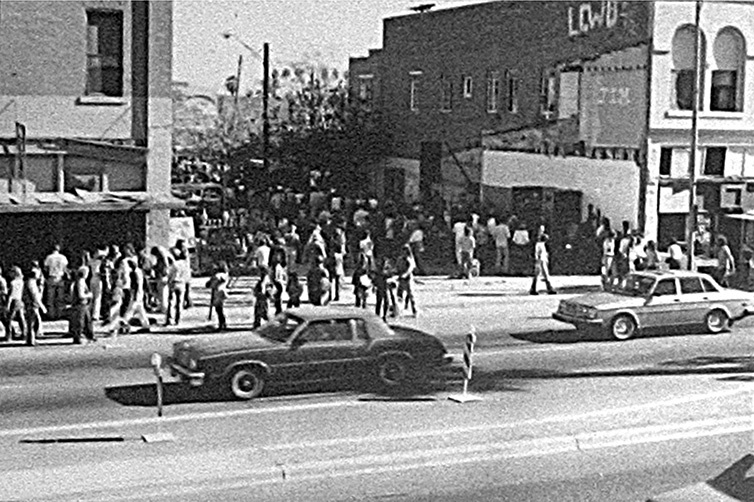 Forty years ago Tempe’s historic street was nothing like today. For nearly a decade downtown was a business district in transition with mainstream enterprises migrating to the “outlying” shopping centers. Young artisans ─ many whom were ASU students attracted by vacancies and low rents moved in to fill the void. Their odd shops were characterized by old-timers as caretaker, “hippie” establishments ─ Circus, the Waterbed Shop, the Inner Sanctum and the Wax Thread. A couple of pool halls and several colorful bars rounded out Mill’s distinctive personality. Downtown redevelopment was still nearly a decade away. In 1968 believing they could contribute to downtown’s emerging urban renewal, three businesses joined to form a loose-knit alliance ─ the Mill Avenue Merchants Association. Many Mill Avenue shops sold handicrafts featuring the works of their owners. With the Christmas season approaching, MAMA figured businesses might make a few extra bucks if they held a sidewalk sale alongside some artist friends. Why not start an art’s fair? Invite friends to set up in front of their stores for a couple days to sell their creations? It’s hard to imagine today, but Mill Avenue’s tradition of art fairs began with a handful of artisans on the southeast corner of Mill Avenue and Fourth Street. The initial attempt was successful enough that it was repeated in 1969. Over the next couple of years the fair grew slowly ─ expanding to east Fifth Street with about 30 exhibitors. As Tempe approached its Centennial in 1971, MAMA gave its event an official name ─ Hayden’s Ferry Arts and Crafts Fair. During the early years the Fair was run entirely by volunteers ─ MAMA members and cronies. By its 10th anniversary the Fair had blossomed to 300 exhibitors, 20 food booths, entertainment and a full-time paid director ─Michael Upp. As the Fair grew so did MAMA’s influence. Not only was it working closely with the city to produce what was becoming Downtown’s largest event, but MAMA was also becoming more politically engaged with shaping downtown’s future. In 1974, with the increasing popularity of the Fair, MAMA felt confident enough to add a spring festival ─ which continues to this day. By 1982 the character of downtown had changed dramatically. New construction stood out against a backdrop of the remaining historic buildings. Capitalizing on its history downtown was now marketed as Old Town Tempe. In 1982 to better reflect the new image, MAMA renamed the Fair the Old Town Tempe Fall Festival of the Arts ─ a 300 artisan event, 42 food booths and entertainment sprawling along three blocks from 3rd to 6th Streets. After the Mill Avenue Merchants Association’s demise in 2003, the responsibility for producing an event that in three days attracts more people than the city’s population was assumed by the Downtown Tempe Community. A panel at the Tempe Historical Museum illustrates the early history of the Mill Avenue Fall Festival of the Arts. 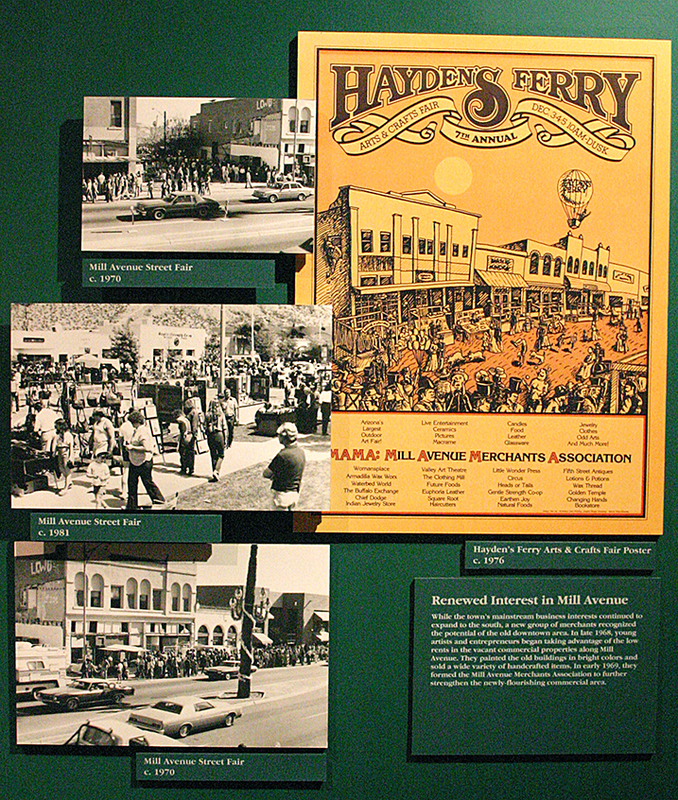 The poster at upper right for the 7th annual event in 1976 is one of the event’s earliest.